THE STORY - Collin is trying to make it through his final days of probation for an infamous arrest he can’t wait to put behind him. Always by his side is his fast-talking childhood bestie, Miles, who has a knack for finding trouble. They grew up together in the notoriously rough Oakland, a.k.a. “The Town,” which has become the new trendy place to live in the rapidly gentrifying Bay Area. But when Collin’s chance for a fresh start is interrupted by a life-changing missed curfew, his friendship with Miles is forced out of its comfortable buddy-comedy existence, and the Bay boys are set on a spiraling collision course with each other. THE GOOD - Raw, honest and filled with energy. Two excellent performances from the film's co-stars. THE BAD - Visuals are lacking a little. Imbalance of the comedic and dramatic elements. ​​​Had "Get Out" not come out around this time at last year's Sundance Film festival, I have a good feeling that "Blindspotting" would be getting hailed as the directorial debut to tackle racial injustice and profiling instead. As is, it may not be as good as "Get Out" but the performances and writing by Rafael Casal and Daveed Diggs are enough to carry the entire film through the finish line, making "Blindspotting" one of the best finds of the 2018 Sundance Film Festival. Collin (Daveed Diggs in a star-making role), is a young black man trying to put a past conviction behind him as his final days of probation in the Oakland Bay Area draws nearer. His best friend since the age of 11, Miles (Rafael Casal - also phenomenal), a white hot-head who tries to act more ghetto as a means of survival, always has his back for better or for worse. As Collin tries to move on, he slowly comes to realize that his loyalty and bond to his best friend might just be the single thing holding him back from having a better life. "Blindspotting." The film is often times edited on beat with the musical choices, performed with such force and enthusiasm by its two co-writers and its themes sneak up on you that by the end of the film, some problems that I had, in the beginning, were then wiped away. What problems did I have may you ask? 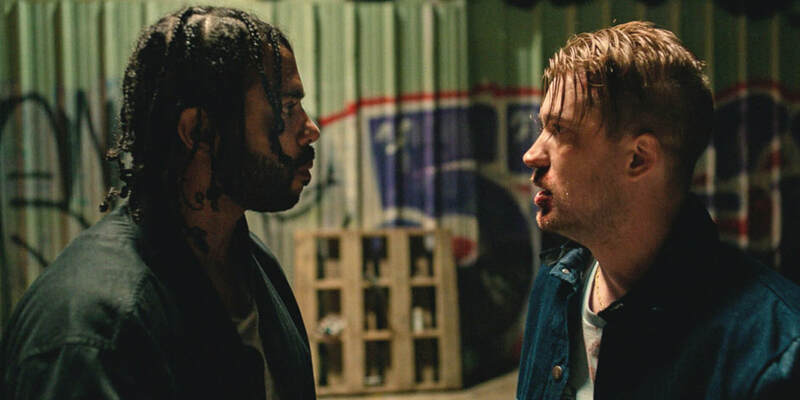 Initially, it's very unusual to tell if "Blindspotting" wants to be a straight comedy (It practically feels like a ghetto version of "Clerks" at times) or if it wants to be a searing drama about racial perception. The answer is both, as the comedic elements become less prevalent and the dramatic elements crescendo by the end of the film, culminating in an intense showdown in a basement where Daveed Diggs lets go of all of his rage, frustration, confusion, and helplessness. The two characters are not exactly who they seem at first which gives "Blindspotting" its thematic power. The point of the film (And where the title comes from) is perception. How does Collin perceive Miles? How does Miles perceive Collin? How are they perceived by their closest friends and family? How do strangers perceive them? How do we perceive them? And finally, how are we supposed to perceive the movie as a whole? Director Carlos López Estrada gradually lets the film's more irregular elements (Such as some music video-styled dream sequences), fade away and give way to character and theme in such a way that after the credits rolled, I could not stop thinking about what "Blindspotting" wanted to say and how it said it. Like one of the many rhymes that are spewed by the main characters, it is filled with passion both positive and negative. With that, there are some negatives here. The visual style of the film is occasionally flat with very little to offer in the way of cinematography and some may find the mixture of the comedic and dramatic elements I stated before as uneven. "Blindspotting" is a love letter to Oakland California, its people, and its culture. In many ways, Carlos López Estrada evokes a younger Spike Lee in how he shoots the film, edits it, utilizes music and expresses the film's theme through the visuals and the performances. At first skeptical, by the end, I was absolutely floored by "Blindspotting." It is a layered story filled with complex characters (And two knockout performances) that asks us to view every aspect of its final product in more terms than simply black and white.